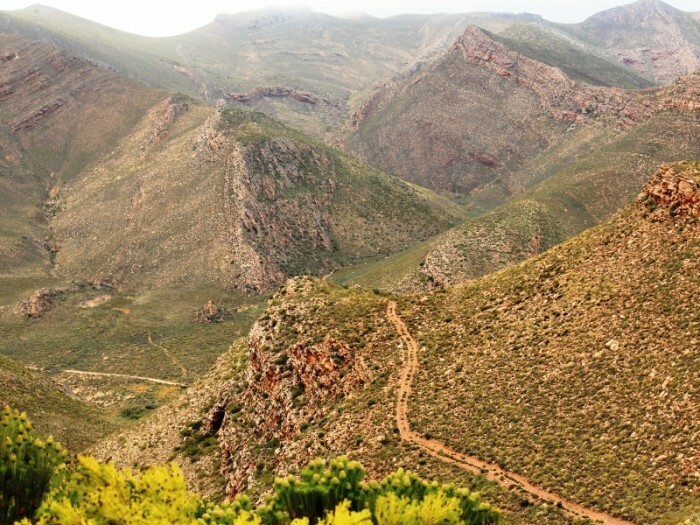 This trail takes one past the ruins of an historic stone home and an unknown grave before starting with a steep climb to a point where one has magnificent views of the central Elandskloof Valley and surrounding Witteberg mountains. A gradual descent, followed by another climb that edges along a steep cliff dreaded by vertigo sufferers, takes one to an area rich in fynbos species. This is also the territory of a pair of klipspringers. When there are flowers, look out for several colourful nectar-sipping bird species. Hereafter, a very steep descent starts, with two hairpin bends along the way. It is always well worth a short walk to check out the first hairpin bend before continuing with this trail. Careful and responsible driving is always important in mountainous terrain. 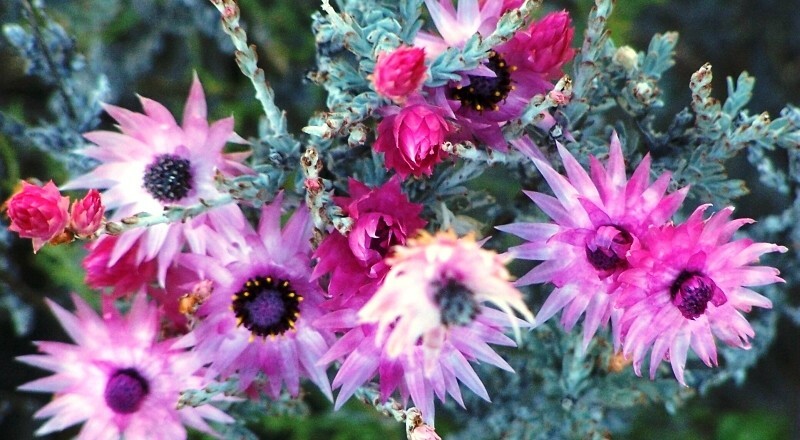 There are more interesting fynbos species along the descent. At the bottom is a T-junction where one can take the Langkloof exit to complete the shortened loop. There are two watercourse crossings before one reaches another T-junction where one must turn left to the Langkloof exit. Continuing on this trail from the first T-junction along the shortened loop, one starts by crossing a deep watercourse followed by a steep ascent over loose shale. This is followed by a steep descent and then a very long and dangerous climb. One short section of the long climb requires some boulder-hopping. Rock falls are always possible from the magnificent sandstone wall towering up high above. The rock formations along the southern sandstone ridge are spectacular, including the Camel Rock appearing on the front cover hereof (signposted). Look out for the pair of Verreaux’s Eagles in this area. At the top of this climb, one has fantastic views of the mountains and skyline towards the east, showing excellent examples of Cape Fold Belt Activity which formed most of the Western Cape’s mountain ranges. Then there is another gradual descent, with a beehive and historic rock staple ladder beneath it (signposted). At the bottom of this descent, one passes the “small” Diep-en-Deur. Look to the left to see the narrow cutting through which the watercourse flows. Another up-and-down and one reaches the Diep-en-Deur (signposted). This is another area with interesting rock formations. Spot the rock formation resembling a Dutch sailor wearing a “klapmuts” and conspicuously looking away from the Diep-en-Deur cutting. To get out of the Diep-en-Deur, there is a very steep ascent which requires good traction and some momentum, especially when very wet or very dry. Careful and responsible driving is again of the utmost importance. A gradual downhill is followed by a final gradual and long climb to the highest point along this trail in the extreme western side of the reserve. On a clear day, one can see mountains all around for great distances once at the top. Many examples of the 350-million-year-old trace fossils, Zoophycos / Spirophyton, can be viewed here and along the entire trail. Also look out for some rare fynbos species before tackling the long descent with three hairpin bends and a very sandy patch at the bottom. This time, vertigo sufferers should sit on the left side of the vehicle. Unexpected mudslides often occur along this stretch, so it is advisable to take along a spade in the event that one has to clear a section of the track. Look out for the honey bush tea plants on the left before one gets to the bottom. When there are flowers, there will be many species of nectar-sipping birds in this area. Spot the old tractor on the right that did not make it back to base. Down in the valley is the start of the Langkloof. The sandy patch at the bottom should be avoided if the ground is wet by taking the bypass on the right-hand side. After crossing the watercourse, a turn-off to the right goes to Bastershoek. Continue towards the left and after a gradual climb one can see the other end of the Diep-en-Deur. 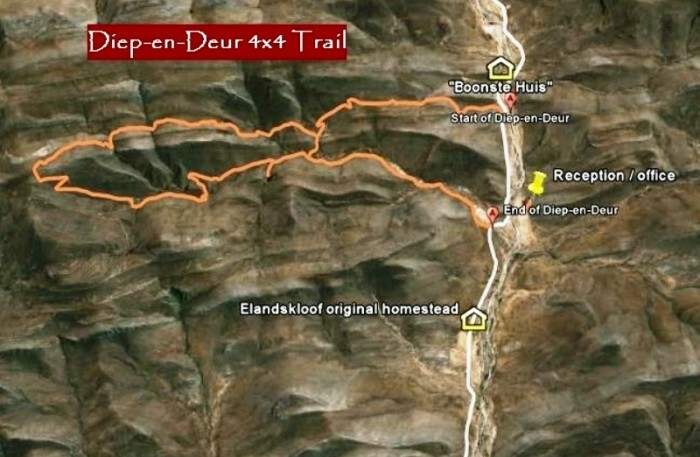 A gradual descent, followed by a steeper descent with some hairpin bends, takes one through the Langkloof watercourse and up to the Seekoeigat (signposted). A short walk down to the Seekoeigat is well worth one’s while. 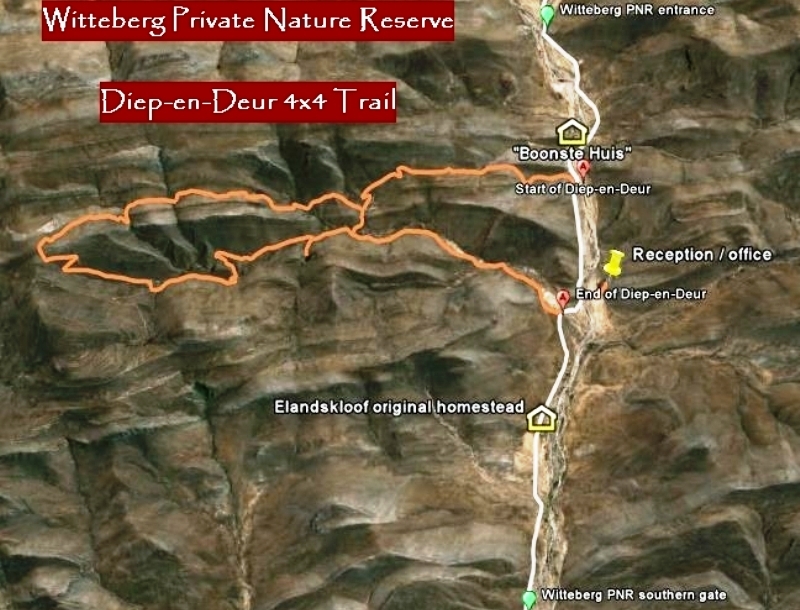 Then the trail continues up a horseshoe bend before going down into the Langkloof again. 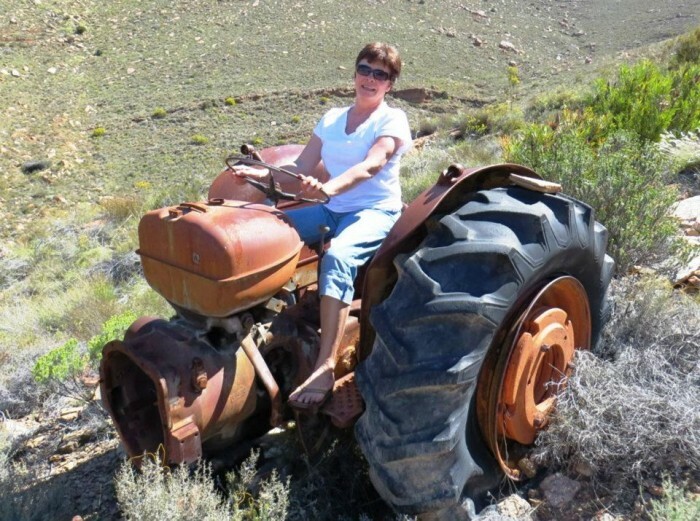 Once down in the Langkloof, there is a turn-off to the right to Grootdam (signposted). This short drive and short walk is well worth the effort. 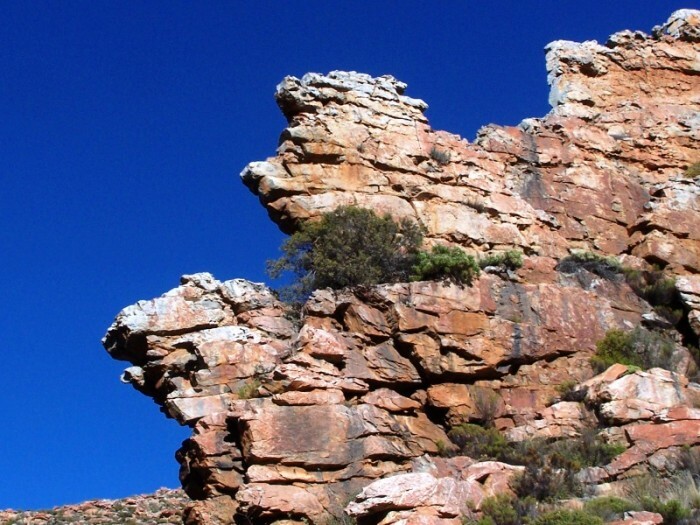 The cliffs above the Grootdam form a beautiful natural rock garden with many fascinating plants and flowers growing out of the sandstone. Back to the main trail, one continues to the point where the shorter Langkloof loop connects. 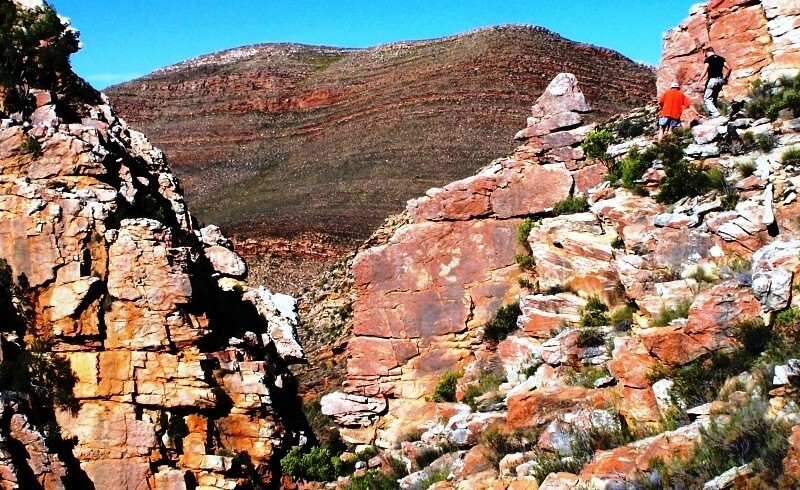 Look out for Verreaux’s Eagles and klipspringers. Two more crossings of the Langkloof watercourse await before one gets back to the main gravel road. A left-turn takes one back to the accommodation units.